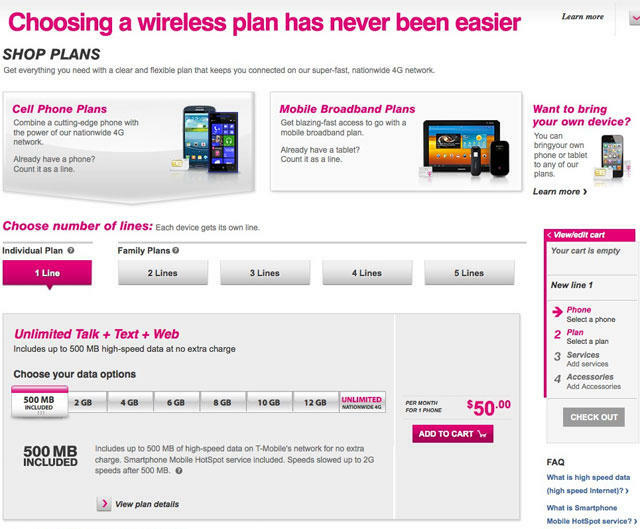 T-Mobile announced a new pricing strategy for tablets today, and I dig the approach. While it's compelling to note that the iPad Air and other tablets will be available for $0 down with various monthly payments to pay off the full cost, the real attraction here is that each tablet comes with 200MB of free data each month. This new offer applies to existing customers, too, T-Mobile CEO John Legere explained on a conference call, and will automatically start to filter in during the month of November. Better yet, anyone can walk into T-Mobile with a compatible tablet and request a T-Mobile SIM to get started. T-Mobile's move is compelling mostly because it's a very European approach to paying for data. I like that when I traveled to London earlier this month, for example, that I was able to walk into a deli (yes, a deli), buy a SIM card, add 1GB of data, pop it in my phone and call it a day. T-Mobile's essentially doing something similar, though you can grab a T-Mobile SIM card, take advantage of 200MB of free data, and then choose to top up at any time by buying 500MB for $10 or weekly passes with 1GB of data for $20. AT&T has a really similar approach where it's offering 250MB of data for $5 per day or $25 for 1GB of data that can be used during a 3-month period, and the nice thing about AT&T's LTE network is that right now it's larger than T-Mobile's – you just miss out on the $0 down option and the free data each month. Meanwhile, Sprint charges $5 for 25MB of data (yes, 25MB), but the plans get more compelling as you add more. 2GB of data on Sprint costs $15, for example. Verizon packages its tablets with its Share Everything plans. If you break down T-Mobile's iPad Air across the span of 24 months, you're still paying the full $630 for a 16GB Air that all carriers are charging, but you have that nice option of free data, which, for me, could be enough to quickly check my email when I need to. Free is free, it's hard to knock this strategy. On particularly busy days, I can just add more data as required, and that means I'm not wasting money on data that I otherwise might not be using. That's the difference, for me, between tablets and smartphones, however. Most of the time I take out my tablet when I have a Wi-Fi connection anyway. But I rely on my smartphone for data everywhere I go, and AT&T has done a really awesome job providing me with the right amount of data and speed for my phone at a price I'm comfortable paying. While AT&T's pricing is still relatively affordable on the tablet front, I think it's safe to say most people are going to opt for 200MB of data for free instead of 250MB of data for $5. The difference, of course, comes down to coverage. Chances are AT&T offers 4G LTE in your area, but T-Mobile's network is still smaller, which ultimately means that 200MB of data will be free, but it could also be slow. I applaud T-Mobile's approach, and I hope to see other carriers start to follow this. AT&T could be disruptive if it drops that newly announced $5 daily plan to free. We've seen carriers react to price changes from competitors in the past, so hopefully T-Mobile's move spurs Verizon, Sprint and AT&T to consider doing the same.